The return of “Black Jack” Randall shakes things up significantly in Outlander as his duel with Jamie upsets all the carefully laid plans. Now that we are moving into the halfway point of the season it makes sense that there should be some significant forward momentum on the main plot as well as some large complications that prevent the whole thing from being resolved at this point in order to justify another few episodes. This is exactly what happens here without making it obvious that it’s happening. Outlander has always been good with the characters with complications in this show stemming from their flaws more often than not. Jamie’s temper as well as his sense of pride is one such example of this and causes lots of problems for him as well as Claire. Arranging a duel with Randall caused a lot of friction between Claire and Jamie because killing Randall means that Frank will never be born. Jamie seemed to agree to do to postpone his vengeance a little too easily last week but this episode digs into why that is. There’s a really touching scene between them where Jamie makes Claire promise to return to her own time if things ever looked to be too dangerous for her and the baby. He agrees to hold off on getting the revenge he needs so that Claire will have something safe to return to. In effect he is showing her that his love for her is stronger than his need for revenge and it has been made very clear how much he needs that. To his mind what Randall did to him was far worse than death. Having seen what that was it’s hard not to agree with him so his devotion to Claire comes through strongly. This strong foundation makes his later decision to go through with the duel after all so much more significant. It isn’t specifically detailed but it appears that Randall abused Fergus and that tips Jamie over the edge. I’m glad it wasn’t shown in details as the image of the British Uniform hung up in the Brothel followed by Fergus being frightened when someone we don’t see enters is more than enough to suggest what had happened. I’m glad that this show draws the line at showing a child being abused but that’s my personal taste as I don’t really like when things get graphic. 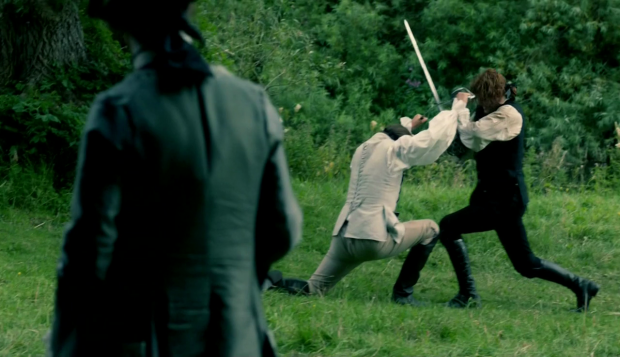 When Jamie duels Randall at the end of the episode he is doing so to quench his own selfish thrust for revenge as well as -presumably- take revenge for what he did to Fergus. It’s a high stakes duel as Randall is highly skilled with a sword plus there’s the added tension of Claire watching on the sidelines as she appears to have a miscarriage. The sequence is incredibly frantic and it almost feels like the future that Claire and Jamie want is falling apart around them. Jamie’s victory against Randall feels fitting given that he stabs him in the groin which is ultimately the root of all the horrors he inflicts on others. It seems unlikely that Randall will die from this injury as he seems to be an antagonist that can’t ever be gotten rid of but it puts a bit of a question mark over whether Frank will be born now from Claire’s perspective. We know that he is because we see him prominently in the flash forwards depicting Claire’s return to her own time. Knowing how things turn out does rob this moment of some of this tension as I think it would be more effective to be unsure if Randall is able to father a child. Seeing how the plan to stop the Jacobite uprising that leads to their horrific defeat fails is something that is being handled really well but the necessary shock over Randall’s injury and what that means for Frank doesn’t land. Claire’s perspective is that Jamie lied to her and regards his need for vengeance over her and the baby. It’s easy to see how she would come to that conclusion as she doesn’t have all of the information. Neither do we as viewers really but the hints are fairly strong. Claire’s reactions does shine a light on a significant character flaw for her. She is so consumed by her desire to make the future what she wants it to be that she is acting incredibly selfishly. She refuses to let Randall receive the punishment he arguably deserves so that her future husband can be born despite all of the terrible things he will undoubtedly do to many other people as long as he is alive. He gets to go through life with plenty of authority and suffers no consequences. He even has the support of the people who have most reason to want him dead so there seems to be nothing that can stop him from doing whatever he decides he wants to do. I’m not saying I dislike Claire for how she is behaving because I completely understand her reasons for doing so. She has always been a conflicted person in terms of her feelings and it’s interesting that I’m so willing to accept the fact that she maintains a marriage as well as a loving relationship with Jamie while considering a return to Frank to be a possibility. The show is framed in such a way that Claire’s temporal polygamy seems somewhat acceptable when it probably isn’t when I think about it. The reason I tend to root for her a lot of the time is that I can’t imagine how I would react in her place. Her marriage to Jamie was originally to protect her but she developed feelings for him after the fact and her hatred for Randall is strong but doesn’t overpower her love for Frank who she sees as innocent in all of this. I do understand why she does certain things but she also doesn’t have the distance she needs from the issues to realise how selfish she is being. It’s a really complex exploration of Claire as a character and this show consistently shows that he life is not a simple one. It could be that Claire’s guilt over what she is trying to accomplish manifests itself in indirect ways. The scene where she is involved in a Mean Girls style gossip session led by the always wonderful Louise heavily suggests this as she breaks up the judgemental conversation by asking if they actually care about the poor or less fortunate relating her experience of seeing a woman and her child dead in the street with nobody caring. The reaction is to suggest that their husbands petition the King to move the poor people somewhere the rich can’t see them. It’s a casually cold reaction and clearly shows the significant class divide in France. I feel that Claire brings this up because she wants to be seen to desire improving the lives of people outside of her immediate social circle but it also addresses an important social problem of the time period. She also uses her influence to pre warn Master Raymond that the King is gunning for those that practice Witchcraft so that could be another example of her guilt leading her to want to help improve the lives of others. I’m really interested in what will be revealed of Master Raymond as his scenes are always very compelling and mysterious. I’m positive he is from another time like Geillis was last season but I wonder when that is. 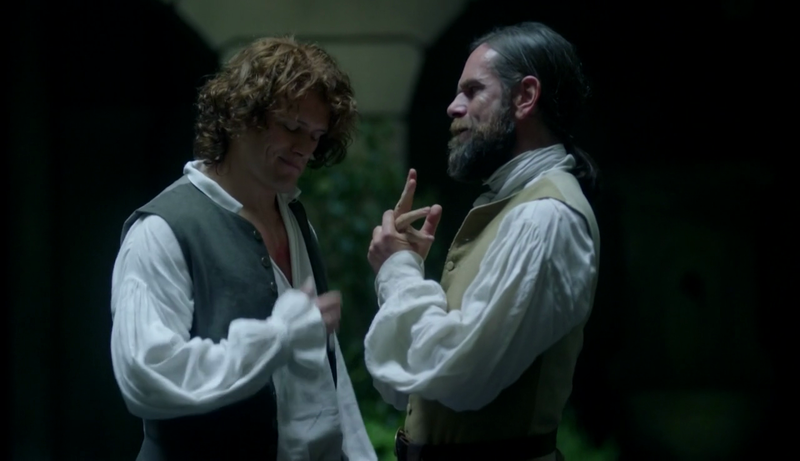 Murtagh finally finds out the truth about Claire in this episode and the result is excellent. It becomes a necessity after Jamie backs out of the duel and Murtagh can’t understand why. 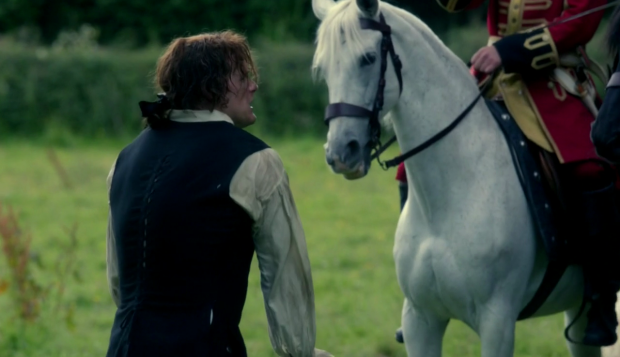 He is shown to be close to breaking point as the display of cowardice from Jamie baffles him. It seems that he needed the duel to take place just as much as Jamie did so the desire to cancel offends him on a personal level. When the truth is told to him he accepts it very quickly which could be seen as really unrealistic but I’d disagree with that. It’s one of those stories that seems too ridiculous to be a lie and it clearly fills in a lot of confusion that Murtagh had about Claire’s progressive attitude in a time where his experience of women was very much the opposite. The conversation he has with Claire about the future and what happens to the Jacobite Rebellion is incredible. Duncan Lacroix’ delivery of the line about not wanting to bear the burden of knowing the tragic future was brilliant and perfectly showed Murtagh’s understanding of what Claire has to live with every day. It’s a massive step forward in the relationship of these characters and it’s a beautifully acted scene. I also liked his reaction to give Jamie the punch in the face he feels is deserved before forgiving him and moving on was great. He trusts Jamie and cares a great deal about him but also wanted him to be aware of how frustrating the situation was for him. It’s a small moment but says so much about them. The latest plan is to fake Smallpox by spiking a wine shipment so that the Comte St. Germain’s resources will be destroyed and he will be unable to lend financial support to Prince Charles. This is complicated by the fact that Jamie is asked to deliver the next batch personally to ensure that it isn’t tampered with. 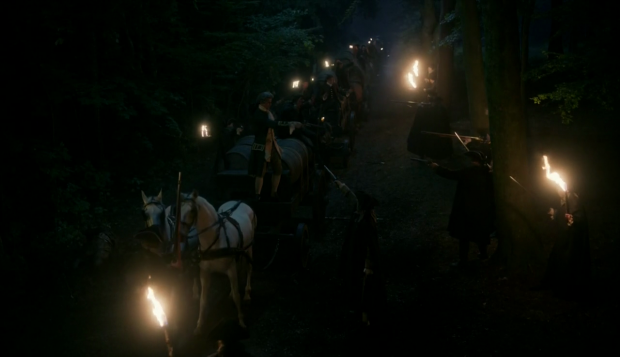 This creates the necessity for Murtagh and a group of hired goons to stage a robbery. It’s a fun action packed heist scene what works really well and breaks up the drama with some decent visuals. It all goes fairly well too and it seems that Prince Charles has been all but defeated. Naturally this will be a temporary setback as we know that the uprising happens and fails but it’s somewhat unexpected to see such a definitive victory at this point. I’m guessing from here we will see how Prince Charles picks himself up and gains more support. The cliffhanger at the end of the episode was really impressively handled with the stakes constantly rising. Jamie’s arrest followed by the graphic representation of the problems Claire is having with her pregnancy work really well. 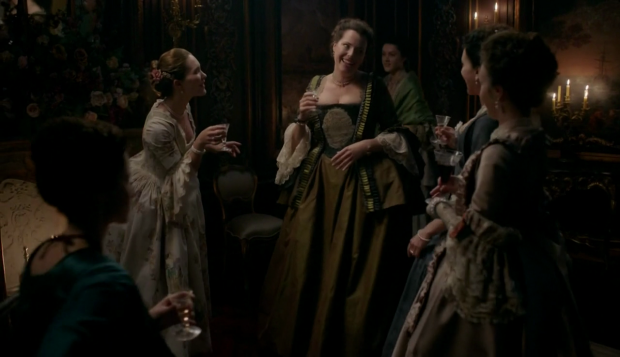 This is aided by an impressive sense of dread that fills the episode through Claire’s increasing stress over the various complications that Jamie comes across as well as her clearly overdoing it. I’m positive that this baby isn’t the same baby that is referenced in the first episode of the season. Either this one is born and she falls pregnant again or she loses it and falls pregnant again. It’s an interesting twist to throw in that ties up how she wasn’t showing in the first episode. A big problem with this episode is that there is nothing about it that stands alone. Everything is an extension of something else that is already going on. Serialised storytelling is fine and definitely something this show relies on but I found myself slightly disengaged with the events here as it felt like too much needed to happen in order to move the season as a whole onto the next stage. It is definitely a very busy episode and some elements lack the proper development as a result. The fake Smallpox story could have carried an episode on its own or even intricately planning a heist that would then be executed at the end of the episode. There was a lot here that seemed to be glossed over. With Jamie in prison and the fate of Claire’s unborn baby in question I wonder what the second half of the season will hold to get Claire to the point we see in the flash forward. There are clearly so many other issues to be developed over the course of the rest of the season. Another great episode that raises the stakes in really interesting ways while throwing in a few interesting twists. Having Jamie postpone his vengeance so that Claire will have something in the future to return to and then go back on that when it seems that Randall has abused Fergus was nicely put together and his arrest coupled with Claire’s apparent miscarriage added a lot of tension to the end of the episode. In a lot of ways there was too much going on in the episode which made the storytelling suffer somewhat.